Dante Chinni, an expert on community analysis, visited the PBS offices last week to share with us his research on America's unique and multifaceted communities. 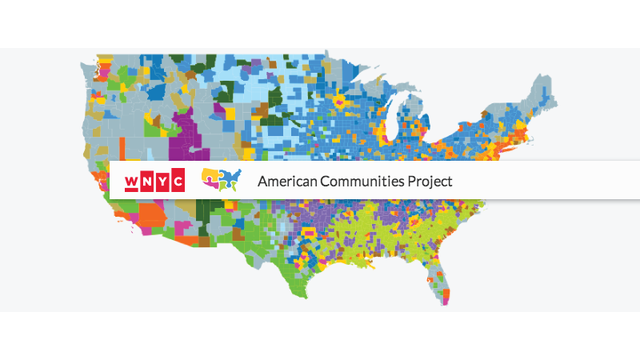 This project, based at American University, uses massive data libraries to breakdown the country into 15 different community types that allow us to better understand the people who make up our great nation. Below, Chinni offers more insight into his research, as well as how local PBS stations can use this information to their advantage. 1. What inspired you to start the American Communities Project? The idea behind the ACP was the same inspiration that pushed me on Patchwork Nation. I have travelled the country a lot as a journalist and been to a lot of different kinds of places. When you do that enough, you begin to notice likenesses and differences. Different kinds of stores and restaurants. Different kinds of radio shows. Different news on the hotel lobby TVs. Different ways of dressing. Sometimes places that are thousands of miles apart seem similar. Sometimes places right next to one another seem very different. I thought there has to be a way to use data to capture these differences, because they are really about the different kinds of places that make up America. So that's what we have done with the ACP. We have created a method for examining and understanding the United Communities of America. 2. What does the shift in these demographic borders mean for American Communities as a whole? It may be a somewhat unpopular notion, but I think the differences that define the 15 communities in the ACP are growing. The rise of and improvement in niche marketing combined with the fragmented world of information and communications are actually pushing us apart somewhat. And changes in the global economy mean that some places are shaping up to be "winners" and some "losers." What this means for the future may be some tough times in terms of governing, in particular. Different communities want and need different things, and in a time of limited resources, those different wants and needs are going to be harder to square. 3. You found that these 15 county types leaned either right or left in their political views. Did you notice a similar trend in the way these communities interacted with different forms of media? I did this analysis with Patchwork Nation, but have not yet done a lot of it with the ACP. Cursory looks at these numbers, however, show some gaps you might expect. The Web allows people to choose their information world and smaller rural areas watch a lot more Nascar, listen to a lot more country, and watch more Fox News. People in Big Cities watch more NBA, listen to more R&B, and watch more MSNBC and Daily Show. This is the story of modern America. The Web is a million-channel cable box. Different people and places that hold different kinds of views and live in different kinds of economies choose different media. 4. How can public media outlets use your project to improve their presence in local communities? I would think that the best station managers know their communities and should know a good deal of what the ACP looks at, but I think where it could help is by giving them a broader sense of their place and seeing all the differences within it. Even within a metro area there can be very different kinds of people and communities, and that can be doubly true for large areas that cover different kinds of rural places -- from farmlands to military communities to evangelical hubs. People in those places may have very different tastes that need to be served. 5. What does the future look like for ACP? Do you have plans for expansion? The biggest plan for the ACP is to move beyond news and topical reports and posts to a bigger effort than can catalog the changes that are currently underway and remaking the country. The biggest and best way to do this would be through annual Almanac that would let us see those changes and monitor them in a systematic way in close to real time. The Census Bureau is already helping me by crunching large data sets they hold using the ACP types. We have access to terrific polling data and consumer data. Putting them all together in a smart, organized way, I think we could learn a lot about what our country is and what it is becoming. There is so much confusion now about about the direction of the country. I think these different communities are heading in different directions and understanding what those directions are and where they lead is critical to pushing the country forward together for the next decade and beyond. Dante heads-up the American Communities Project at American University and writes the Politics Counts blogfor the Wall Street Journal. You can follow him at @DChinni to stay up to date on his work.